With the end of 2015 upon us, we thought it would be a great time to take a look back on a year that saw an already-cohesive team grow closer through team-building events and grow literally, with the addition of 19 rockstar members. 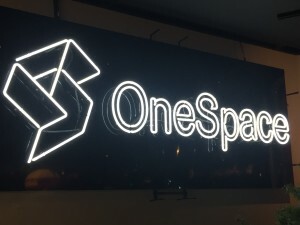 This has been the biggest hiring year ever for OneSpace. We’ve added 19 new team members across six different departments. That’s a pretty large increase to a team just under 60 strong. Our Engineering, Product, Marketing, Client Solutions, Account Services, and Facilities teams have all grown, and it’s only served to make our culture stronger. Growing an internal team is tough, and we make it tougher on ourselves with our commitment to bringing on only remarkable people. That’s the not-so-secret secret to success that not all companies in growth-mode follow: Only hire the right people. The phrase, “work hard, play hard,” gets tossed around a lot. At OneSpace we mean it. And we can prove it. Not only do we have catered team lunches every single Friday (Qdoba taco bar, anyone?) and bi-weekly indoor pickup soccer games (which help us shed some of the pounds gained by indulging in those catered lunches), we also enjoy a number of larger events, complimentary for all team members, that bring us closer together. And there’s everyone’s favorite, Farm Day, where the entire team heads out to our owners’ “farm” in rural Illinois, complete with lake, pool, basketball and sand-volleyball courts, and unlimited food and refreshments. Sprinkle in numerous impromptu happy hours, barbecues, movie nights (Star Wars on opening day!) and popcorn deliveries, and you have a recipe for a team people not only want to join, but one they want to stay with. OneSpace expects to grow at an even faster rate in 2016. Although not all opportunities are posted to our careers page just yet, rest assured, they’re coming. And if you’re as remarkable as the 19 new team members we welcomed this year, we’ll be honored to have you join our team. To check out our current opportunities, visit our careers page, or email careers@onespace.com if you have any questions. Interested in joining our freelance workforce? Sign up here.